Motherhood…such a precious blessing. The most treasured part of a woman’s life. Carrying a life inside, who is a part of you, who is solely yours for those nine months…words are never enough to describe that feeling. It is beyond any vocabulary. Exactly a year after my marriage…one evening I read the home pregnancy kit and savoured the double lines in it. I danced, and then slowed down with the fear that the baby might feel the impact. Joy burst through every cell of mine, and I walked on clouds. Wore a smile always, even when I puked early in the mornings. She- or maybe it was a he- became my foremost consideration. The very first time I looked at the scan report, there was a flutter of excitement and then panic. Scared, God, I was, for this new journey. I looked twice through baby clothings. I dreamed of her, her smile. In the lonely days, she had become my companion, my pal. We talked, in a language only we two could understand. She became my solace. My comfort. She was my magic. My new light in the dusk. God, I loved her so much. I loved, and dreamed dreams of her. A future, a beautiful one with her in it. I dreamed of rooms scattered with her dolls -or if it was a boy, his cars- and dreamed of how I would paint her room. I dreamed of holding her, touching her, loving her. Only 20 days after knowing of her existence, like a sudden rainbow on the rainy noon, she vanished. August 3, 2013…One damp morning, I woke up to see my baby bleeding away. It was all done, before I could fully comprehend. Before I could grasp hold of reality, she was wiped clean from my womb. Just like that, she was no more. Just like that, all my dreams were shattered. Just like that, I was no more a Mom. Death had arrived like a tornado, and picked her away from my womb and carried her to some far away land. Heartbreak. Never known it aches more than tangible, physical pains. It did for me then. Drowned in tears, I had no words for people around me. No, I didn’t want consolation. I didn’t want to hear another one saying… ‘You’re still too young.’ I just wanted to scream and curse. God. They would never know. Tears became my only company. Sanity swinging from this side to the other, I crawled inside my blanket every night, and cried until I didn’t have any tears. Death… it took my first child away, my first memory of motherhood stayed just that… A memory. Two years later, on another one of those evenings and with much more hesitation I opened the home pregnancy kit that had stayed in the refrigerator for almost a week. ‘Please, be a double line, please…and not be the single line I often get.’ A long wait, loads of prayers, bucketfuls of tears and many single lined kits later, I got the result: Positive. I am going to be a mother. The second time. I still remember, how I just shouted and laughed and then burst into tears. The scan showed he was fine. ‘God,’ I thought with a smile, ‘here is my magic. My miracle. My beautiful beginning. My dream has finally come true.’ I closed my eyes with happy tears. 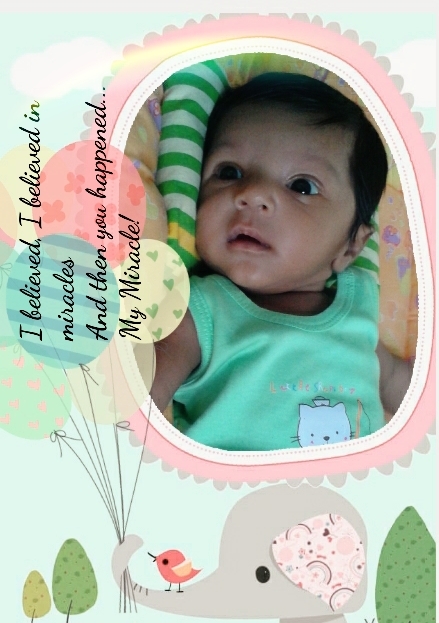 I am a Mom again… for the second time and this time to a living, breathing child. For both my pregnancies, my LMP was April 13. I found out that I was pregnant from the kit on June, but doctor said the child was conceived in May. In both cases, my delivery date was in February. One ended in death, one started a life. Coincidences? Or is that fate? So tell me… don’t miracles happen? For one day, for you, for me, for all of us, miracles will happen!